It was the unpeated one. 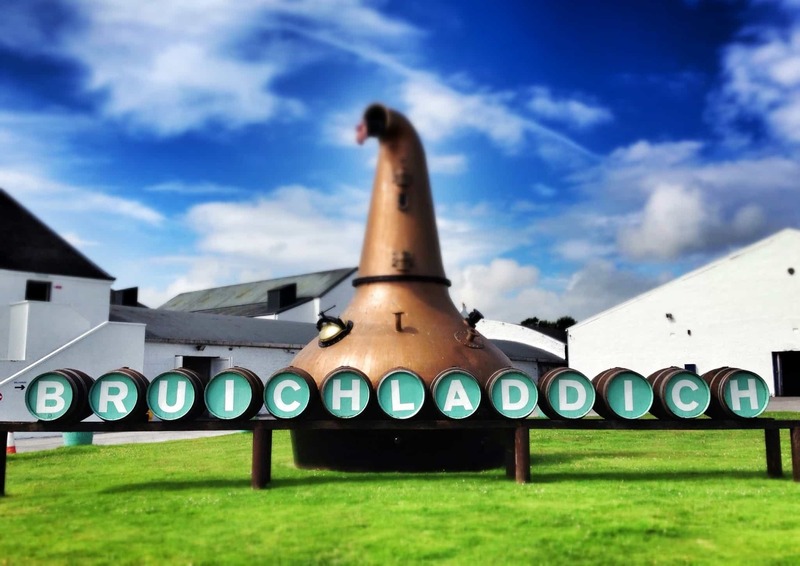 Of the Islay distilleries, Bruichladdich was meant to be the one that produced a lighter, unpeated single malt. That’s certainly how it seems if you read any books that were printed a decade or more ago. It’s not the case today. Bruichladdich is an old Islay distillery, built in 1881, yet it is the more recent history that’s of interest to people. After being mothballed, in 2000 Bruichladdich rose from the ashes to become a new, fiercely independent distillery. Their ethos was anti-corporate, and against the grain of much of the rest of the whisky industry at the time. Bruichladdich was progressive, interested in localism, in local expression – known as terroir – and in doing things the old-fashioned way. They were experimental, too, trying lots of different cask finishes to explore what happened to whisky. During this era, there were a phenomenal number of releases. They even made gin. In 2012 it was purchased by Rémy Cointreau for £58million. We saw a maturation of the distillery – a streamlining of the range, an effort to reach more whisky drinkers around the world. The legacy of that brief reign of independence is not to be overlooked. Today every new whisky distillery pretty much does what Bruichladdich did. Clever label design, outreaching on social media, blogging, trendy videos, trying interesting cask experiments, pushing local expression. Bruichladdich did it first. They set the template. Why the preamble? 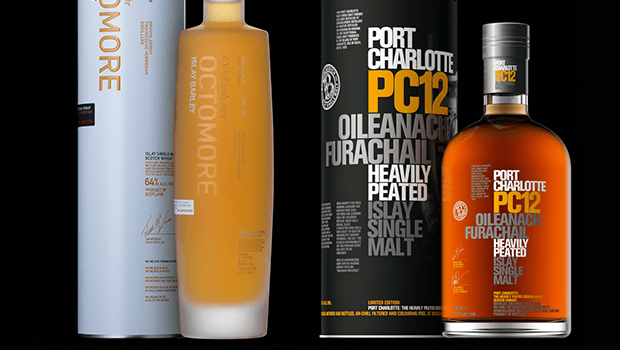 Well, the peated Bruichladdich whiskies come in the Port Charlotte and Octomore ranges. They’re symbolic of the new era of the distillery, and the latest Octomore in particular represents the culmination of what the new regime is about: terroir, innovation, the land. And I happened to receive samples of the latest Port Charlotte and Octomore whiskies. They were kindly sent to me by Carl Reavey of Bruichladdich, who I met a little while ago when I visited the distillery. You could say I was rather excited to see how these peated whiskies are developing. This was made using 100% Islay-grown barley. The crop was sown in 2008 by farmer James Brown (a force of nature, and great character) on Octomore Farm. The details become more precise: “This lies close to the western shore of Loch Indaal on the Rhinns of Islay, and within sight of the village of Port Charlotte.” I’ve stood there next farmer James Brown and enjoyed the view myself. The grain was peated to 258ppm before distillation – eclipsing former peat levels. 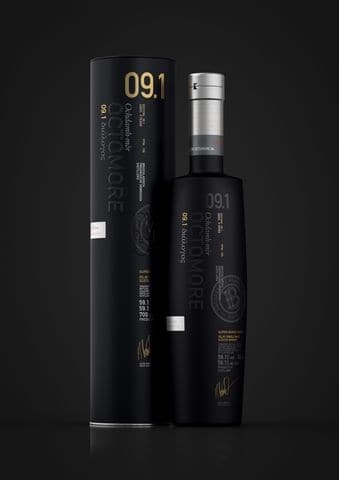 Octomore 6.3 Islay Barley has been aged for 5 years and bottled at a knee-trembling 64% ABV. A bottle costs £150. Colour: deep copper. On the nose: weirdly approachable. At that strength I was living in fear, but this is delightful. The peat – weirdly – isn’t as obvious as the Port Charlotte. I guess it’s tightly bound within the spirit, waiting to be unleashed. In fact, leave it a while and you can smell the peat from across the table. It’s here, but it’s different. Very deeply vegetative, earthy, ashy, mossy. Agricultural. Lapsang souchong. Burnt candles. In the distance there’s something sweet, but under the weight of those other unusual, delightful aromas and the strength of the alcohol, you’d do well to give it a name. In the mouth: [Before I describe it, there’s always something wonderful when you’re about to taste an Octomore for the first time. Almost the thrill you get when a rollercoaster begins its ascent.] Christ almighty that’s intense. It’s a hot whisky, no doubt. Brings to mind the heat of a chilli. A deep, perhaps more ashy peat than the Port Charlotte. Big and chewy maltiness once you clear your way through the smoke. A honeyed quality, or even a treacle sponge pudding. The finish is endlessly warm. It’s unmistakably Octomore. It’s bold as brass and needs a lot of time to get to know it, to coax out the nuance of flavours. Not really a sipping dram – one to share with others, to question and to marvel at what’s going on. 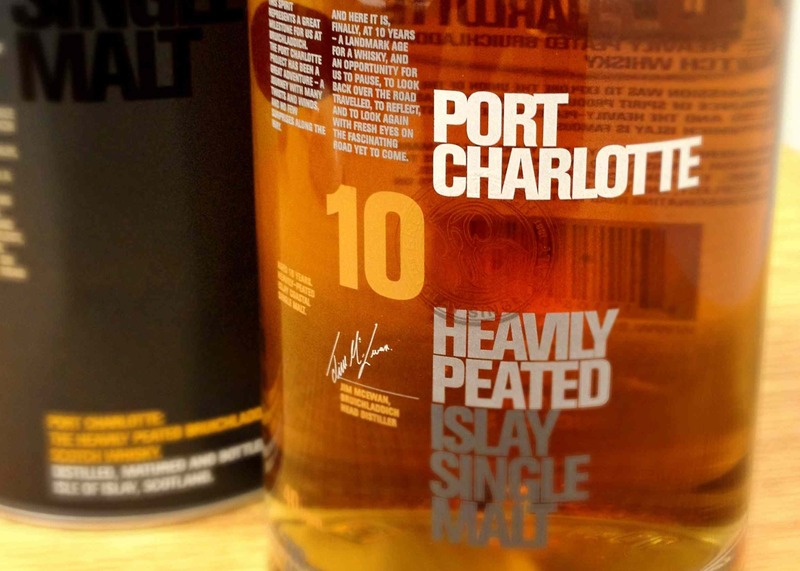 Port Charlotte is Bruichladdich’s heavily peated range of single malt whisky. Generally they’re peated to about 40ppm, which makes them as smoky as Ardbeg. It’s designed to evoke the whiskies made at the old Port Charlotte distillery, which may yet one day be resurrected after much speculation. The PC12 is 12 years old and bottled at 58.7%. It’s available only at travel retail. Colour: slightly darker than the Octomore, oloroso sherry to russet. On the nose: probably one of the most balanced noses I’ve come across in a while. There’s a sweet peat note that isn’t overwhelming, and it triangulates with a briny, maritime aroma as well as touches of sultanas, dried apricots and raisins. Beyond that there’s a lovely buttery, vanilla custard quality. It’s incredibly intimate for a high-strength whisky. In the mouth: whatever gentleness there was in the nose, this becomes a bruiser in the mouth. That Laddie texture is still here – it’s a velvety, heavy dram, but the spirit always tends to be slightly concealed beneath peat (not that it matters). The strength manifests, peat riding the first wave. The aromas follow through perfectly on taste – a lovely tart sweetness, in the form of toffee and redcurrant, blackcurrant maybe, and those flavours seem to match the peat nicely. In fact, the peat takes on more earthy notes than the sweetness of the nose first indicates. Honey – mead, maybe cider too. Then it’s wonderful maritime notes towards the finish: a coastal walk in autumn, flecks of salt across the tongue. The Port Charlotte PC12 edges this for me. It’s exceptionally well-balanced, and has one of those noses that I could keep sniffing all night. It’s also one I’d just casually enjoy – with or without friends. And these whiskies are becoming increasingly important to me. That said, the excellent Octomore whisky continues ever-deeper into whatever dark place the range is headed. Crazy, and not for the casual drinker. It’s for explorers. 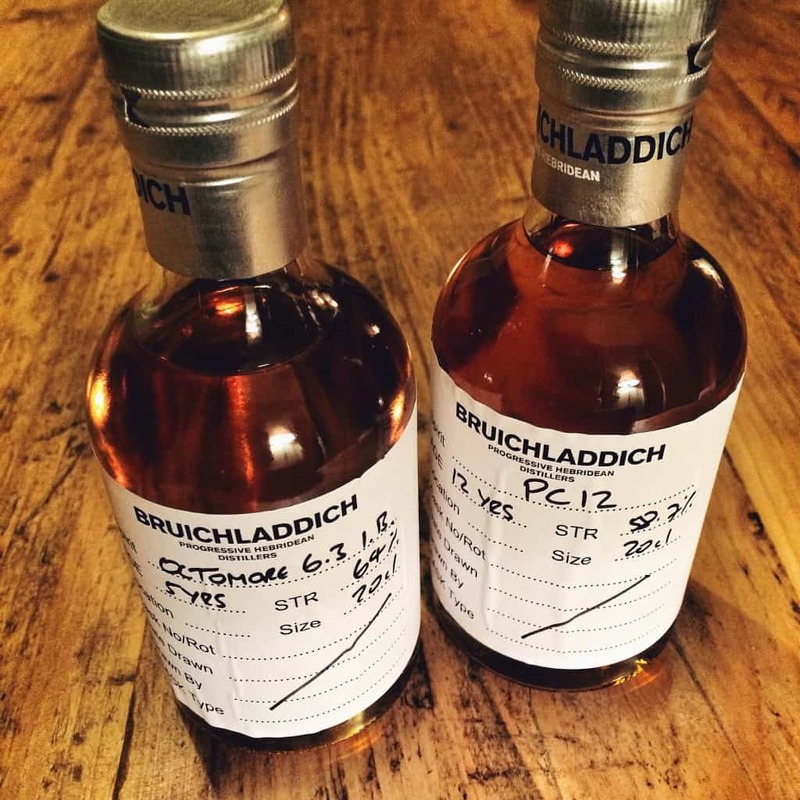 I think that in the age of hip new distilleries trying hip new things, shouting about their produce on Instagram and Twitter in a calculated manner, it’s easy to overlook the more mature form that Bruichladdich has taken. Sure, it’s not releasing dozens of crazy bottles each year, and it’s not winding up the Scotch Whisky Association as much as it used to. Therefore the spotlight may not fall upon it quite as much. But rest assured, the thing that matters is this: it’s knocking out f*cking brilliant whiskies, of a quality that puts many other distilleries to shame, and it’s doing so with more consistency than ever before. I am looking forward to sampling the 13 year old independently bottled Port Charlotte at Christmas that I got from The Whisky Exchange. I loved the 6.3 so much, I ordered a second bottle to hold in reserve. I disagree that “Water is for wimps”. A single drop is enough to release flavours locked in the alcohol. I like to savor my first sip of Octomore neat. Then add a drop of water and appreciate the complex changes that develop. Another drop – yet more evolution. Just a drop or two. I saw that Rest & Be Thankful bottling so you’ll have to let me know what you think of it. And I was being playful with that comment on water – I’m often being sarcastic on here! I sometimes put a drop in to dilute the ABV and open up the flavours.